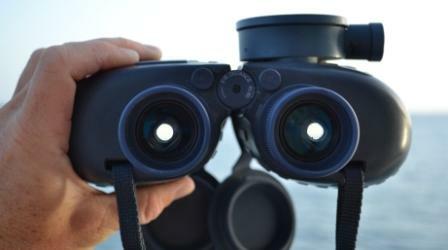 The Best 7 x 50 Binoculars Onboard! 7 x 50 binoculars are, to me, one of the most essential navigation tools onboard. They literally add to the feeling of safety! Remember when you wanted to enter an unknown harbor and you couldn't make out where the entrance was? Or, when you were sailing or motor cruising at high speed and you saw something in the water further ahead? Driftwood, a rock, a fishing net...? In all these cases and others, the marine binoculars help out! But, how do we choose one? One that is strong, accurate and will be a long lasting shipmate! Well, there are a few things to know before you buy this precious tool. 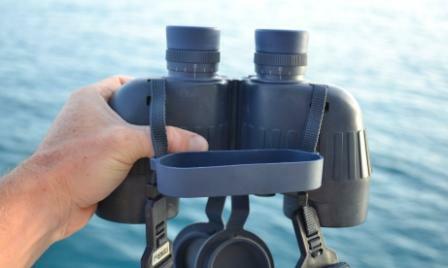 First of all, 7 x 50 binoculars are considered as the standard for marine purposes. The first number, in this case 7, is the magnification. It means that the object you are looking at, is 7 times bigger through the binoculars than if you look at it normally. This number also dictates your field of view. The higher your magnification, the narrower your field of view will be. This is the reason why a magnification of 7 is good for marine purposes. If you go higher, it is much harder to look at an object while standing on a moving boat! The second number, in this case 50, is the diameter of the binocular's objective in millimeter. The bigger the number, the brighter the image. The lower the number, the darker the image because less light is entering the binoculars. 50 is the ideal diameter. It's no use to go higher, because the pupil of our eyes in its most open position cannot absorb more light than with a 50 mm objective. So, now we know we have to go for 7 x 50 binoculars! When you look around, you will see that there are a lot of makes and several extra features to choose from. 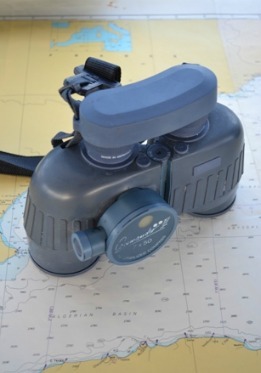 Some boating binoculars have an auto-focus, which means they focus automatically, provided that you have perfect eyes or your eyes are corrected through contacts or glasses. Other have a small wheel that you have to turn to focus manually. A compass with built-in light is another feature, together with waterproofness, shock resistance and the fact that the binocular will float when it is dropped in the water. During my years of sailing and motor cruising, I have come across a lot of binoculars from several manufacturers and with different features. Some I likes, others reminded me at a children's toy! I would definitely recommend a good quality 7 x 50 binocular with a compass that has a built-in red soft light. One that is complete waterproof, at least 2 meters depth. It's no use to go cheap on this. What's the fun of looking through binoculars with condensed objectives. It's like looking through a dirty beer glass! Your marine binocular also needs to have a good grip, be strong and shockproof. The marine environment is pretty tough! I especially recommend the Steiner binoculars. They are, for me, the number 1 in marine binoculars. I have used them on the last three yachts I have worked on and there is no other make that can match them! They are not cheap, I admit, but they pay themselves back through their lifetime! Don't forget that binoculars are very refined optical instruments. Steiner has two models for marine purposes, the Navigator and the Commander. They offer 10 to 30 years of warranty, so they are pretty sure they make quality. This is also proven by the fact that the military and other professionals use their products! So, the bottom line is that if you're serious about your hobby and passion, you need a good pair of 7 x 50 binoculars that will last!